I am part of a small group of UK-based adventurers who take it in turns to write for each other’s websites. Writing this month we have Tim Moss, who also happens to be my Logistics Manager, and next month I’ll be writing something for Dave Cornthwaite who is currently paddling the Mississippi. Sarah’s expedition is a massive feat. She has undergone serious physical conditioning to get where she is, worked hard to secure the financial support and committed to several years away from home. It’s unlikely that most of us will ever be in the same position as Sarah but I don’t think that should stop us from having the same thing that she’s having: an adventure. Running the length of every Tube Line in London – Exploring the capital on foot, 3 to 45 miles at at time. Weekends only over nine months, no time off work. 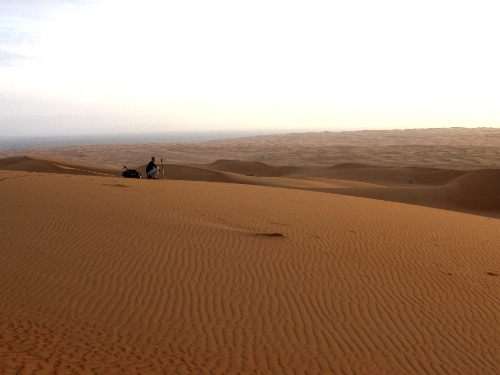 Crossing the Wahiba Sands – Three days carrying all our water over endless dunes, we capitalised on a National Holiday to avoid time off work. Admittedly we lived in Oman at the time but it still felt like quite an achievement to cross a desert in a weekend. 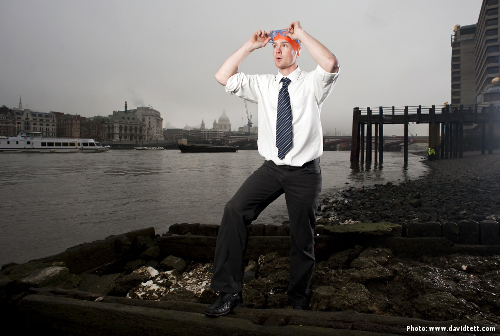 Swimming the Thames – it’s over 100 miles long and we’ve only done a fraction of it this summer but all on free weekends. So maybe you’re now thinking: “Well fine but I couldn’t swim that far and I don’t fancy running 45 miles!”. The Everyday Adventure – Last year I ran a campaign to encourage people to make more of their lunchbreaks, exploring new areas and seeing how far they could get in an hour. I urged my readers to rise early and cram in a mini-adventure before breakfast or reclaim the night and expedite in darkness. London’s A-Z of Food – Even more sedentary, Tom Kevill-Davies is experiencing the world’s foods by visiting an A-Z of restaurants across London this year. That may not sound the same as rowing an ocean but there are many different ways to be adventurous. But don’t such things costs money? Don’t you need sponsors? No! I’ve flown to Siberia, hiked into the mountains, climbed a peak that had never been climbed, and flown back to the UK for under a thousand pounds. That felt pretty adventurous to me. But a thousand pounds is still a lot of money, right? 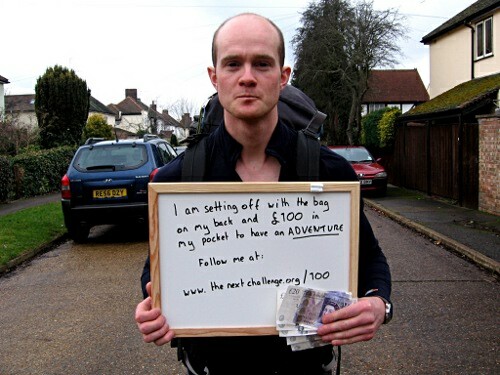 The £100 Adventure – Last year, I set out with £100 in my pocket to hitch-hike around the country and have an adventure. I swam in the sea, slept under the stars, drank Guinness in Dublin and got back to my house ten days later with thirty-five pounds change. Micro Adventures – Alastair Humphreys is another advocate of cheap adventures and his – which include walking around the M25 and using budget flights to cycle andpaddle across the Shetland Islands – are much better than mine. So be inspired by what Sarah’s doing but don’t be daunted. She may have super powers but you can get a slice of what she’s having without them. This article was written by Tim Moss as part of the Adventurer’s Blogging Chain. The previous post was Planning a River Expedition by Mark Kalch. The next article will appear on Dave Cornthwaite’s website.